Memorizer è uno strumento per studiare e memorizzare elenchi di dati. This is the first version of Memorizer, a tool for studying and memorizing lists of data. It has testing modes of flash cards, multiple choice, and matching. It also includes a helpful vocabulary building list feature, which automatically fetches the definitions of entered words. 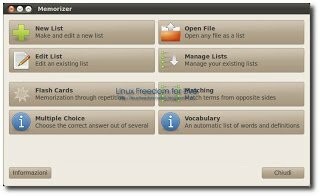 Lists can be exported to plain text format and existing list files, such as those from sites like quizlet.com, can be opened and edited in Memorizer. This version includes partial Spanish, Italian, and Russian translations. Many thanks to Feder Sáiz and Israel Guerras (Spanish), Nicola Piovesan (Italian), and Alexander Semyonov (Russian). 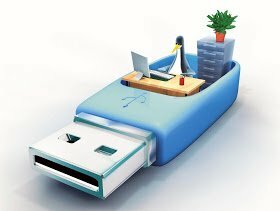 confermiamo e alla fine avremo il nostro Memorizer installato. Per installare l’applicazione nelle versioni precedenti di Ubuntu basta consultare QUESTO articolo.